I know I’ve said before that I love the church and I love being part of what God is doing in and through the church. If I am honest though, there are some things I love about church more than others. One of my really favorite things about church is this night–the eve of our celebration of the resurrection. One of the names for this night is “Holy Saturday” and on this night many Christians gather to keep vigil for the resurrection of Jesus. I realize how odd it sounds to talk about keeping vigil for the resurrection because we as Christians already know the “rest of the story.” I go to church three nights in a row: Maundy Thursday, Good Friday and Holy Saturday. Each service lets me dwell on some part of the story so I can contemplate its significance. Yes, we know how the story ends, but it is important to keep telling/hearing the story. This night, this Holy Saturday, I will be at my church’s vigil. It is my favorite church service of the entire year. I love the vigil more than Easter Sunday. I would MUCH rather stay home for Easter Sunday to meditate and reflect on the “reason for the season”. Honestly, if I stayed home I would probably just sleep and not do anything very meditative at all. Still, her point about meditating and reflecting on what it is all about it gets at why I like the vigil even more than Easter Sunday itself. At the vigil we light candles and slow down for a while. We hear the Old Testament stories of how God has been at work throughout all of human history. We get to see the broad strokes of our salvation history. We get to make connections between the Old Testament stories and the Jesus story. I know not every church has a vigil, and I recognize that this may still feel too contrived for some. But for me, this is the night! What about you? 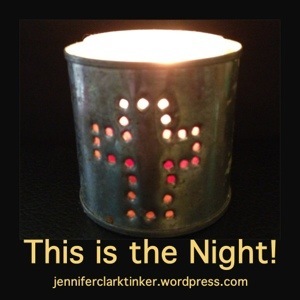 Do you attend a vigil? What is your favorite Old Testament story and how does it connect with the Jesus story? What has been your favorite church service? Is Easter Sunday a challenge or a joy for you? What helps you connect with the spiritual realities of Jesus’ death & resurrection? Jen, will be at the Chapel of the Resurrection tonight! Easter Vigil is also my favorite service of the Church Year. I’ve never been to the one there. You’ll have to let me know how it goes! Moses — I’ve always connected a lot with his struggles and faith, etc. And of course, the whole Passover feast with all the symbolism in it. Our previous church held a shortened Passover Seder one time and it was awesome! Good stuff! I like the baptismal analogies with crossing the Red Sea. Abraham when he goes to sacrifice the one whom God calls his “only son” Issac. The pointing ahead to what Gods plan was in sacrificing His only son for us are amazing! Good story! Since becoming a parent, that one hits me harder.